VIATRA is an open source model transformation framework, focusing on efficient evaluation of model queries and supports various transformation workflows. This document contains a tutorial for getting started with the query and transformation development. The tutorial relies on the CPS Demonstrator application. The CPS Demonstrator is specified to cover a usual workflow in Model-driven Engineering, where a system is (1) first described in a source model, then (2) automated model-to-model transformations are used to derive a target model. Finally, (3) model-to-text transformation is performed to generate code from the target domain. In addition, a model generator that can automatically create source domain models can support the correctness testing and performance evaluation of the components. This tutorial uses only a subset of the transformation problem, as its main goal is to illustrate the basics of the VIATRA environment. Consult the original demonstrator for a more complex transformation example. 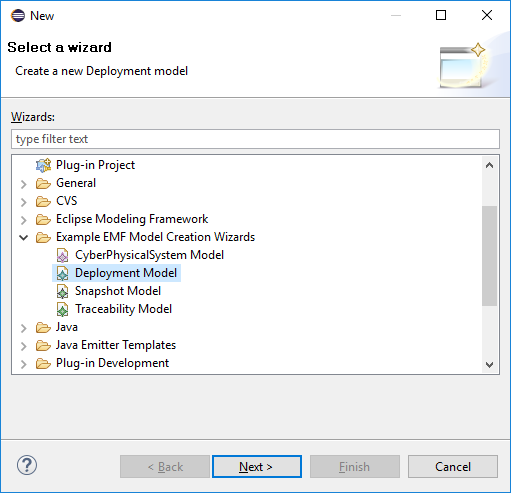 We expect readers to be familiar with the basics of Eclipse plug-in development, more specifically creating plug-in projects and defining basic UI extensions such as commands. Additionally, we expect a basic understanding of EMF-based modeling. If required, look at the Plug-in development tutorial at http://www.vogella.com/tutorials/EclipsePlugin/article.html or the EMF tutorial at http://www.vogella.com/tutorials/EclipseEMF/article.html for a short presentation on these subjects. This tutorial includes a quick setup guide, then describes both model query development and their usage in the query runtime. Then, both batch and event-driven transformations are covered. For a faster installation, you may deselect the Contact all update sites during install... field, but then it might be necessary to install the required Eclipse Collections and Xtext Runtime features manually. 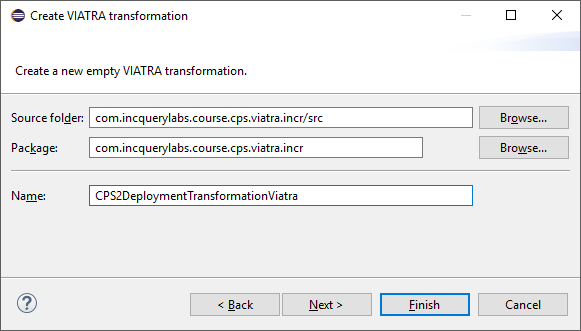 VIATRA defines a custom perspective called Transformation Development that includes a few views and shortcuts that make it easier to develop queries and transformations. The remainder of the tutorial expects that this perspective is selected; in case a different perspective is used, the corresponding views and wizards are still available in their standard respective locations. The CPS domain specifies application and host types and their instances, requests and requirements on applications and resource requirements of applications towards hosts. Application types have a state machine that describes their behavior through states and transitions. Finally, application instances can be allocated to host instances that can communicate with each other. Host instances have a unique node IP address. Application instances have a unique identifier. State machines can define an initial state. Transitions may specify an action for sending or waiting for a signal. A signal can be sent by providing an application type (with its ID) and a signal identifier, while waiting for a signal is done by specifying its identifier. 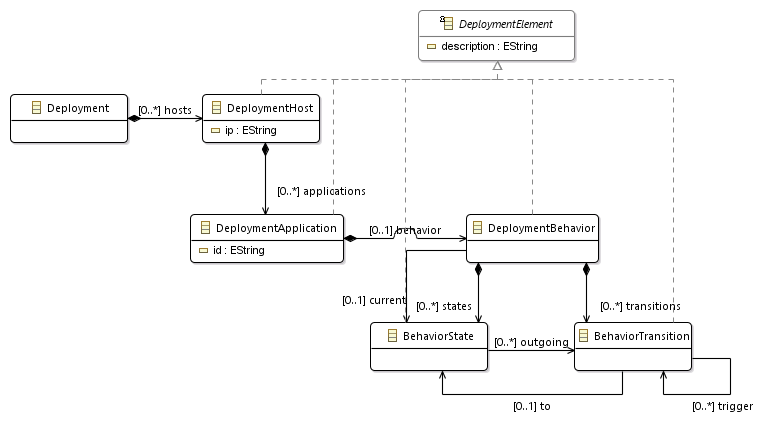 In the deployment model, host instances contain the applications that are running on them, while each application has a behavior with states and transitions. The behavior has a current state and transitions may trigger other transitions when the triggered transition is waiting for the signal they are sending and the application type is correct. The traceability model describes the correspondence between a CPS and a deployment model. The traceability is stored in a set of traces that refer to zero, one or multiple CPS and deployment elements. Constraints and conditions in the VIATRA framework are expressed using a graph pattern-based language. This declarative formalism allows very compact definitions of complex conditions, while it is still possible to provide live query evaluation based on the Rete algorithm. In the following we get an overview of the query development environment, starting with the definition of queries, followed by query evaluation support. Then we gain an understanding of the various language elements by creating more and more complex queries. A graph pattern encodes a named query with some parameters defined as a disjunction of pattern bodies, while each body consists of a set of constraints. The result of a graph pattern, called match set, is a set of (model element) tuples where the elements fulfill all constraints defined in at least one of the pattern bodies. The pattern language always works on sets: neither the constraints nor the match set is ordered; and match set never includes multiple tuples with exactly the same model elements. 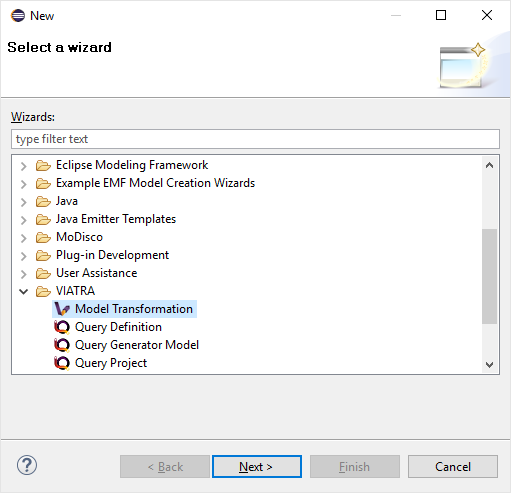 Create a new VIATRA Query project in the host Eclipse with the following name: org.eclipse.viatra.examples.cps.queries. Looking at the pattern header, we see that this pattern has two parameters, meaning its results will be a pair of values, the first selecting a HostInstance from the model, while the second one a String literal. The connection between these elements is described by a single constraint ensuring that ip variable stores the nodeIp attribute of a corresponding HostInstance. VIATRA includes a view to evaluate the results of queries over various editors, and reacts on changes in the editor. The Query Results view is the primary tool for debugging graph patterns. Open the view by selecting Window/Show View/Query Results or you can simply press the CTRL+3 shortcut and start to type the name of the view. The view allows loading models and queries, and display (and update) the results of queries automatically. Together with the installed metamodels there is also an example instance model included that will be used in this tutorial as an example. At this point the Query Results view should contain the matches of the freshly created pattern. Using the example model, you can see that there are 6 matches for the pattern, each consisting of a HostInstance-IP address pair. Note that the Query Results view provides live results: by updating the model in the model editor file, e.g. adding a new host instance or changing its IP address, the results update automatically. If the 'Load model from active editor' button is not enabled, it either means, the current editor does not contain a model, or VIATRA does not understand the editor type. By default, EMF tree editors are supported; other editor types, such as graphical editors are supported by additional integration plug-ins, such as the GMF or Graphiti integration available from the VIATRA repository. In the following, we define a set of patterns that illustrate additional capabilities of the query language. Each pattern will come with a short definition, followed by the code itself and some remarks about how the pattern works. This pattern, similar to the first pattern, still consists of a single constraint. The pattern constraints can refer to Java literals, like empty strings or numbers directly. This pattern should have no matches in the example model, as by default all instances have a non-empty IP address set up. Notice that if you create a new HostInstance element, it will not appear in the match results. This happens because in EMF unset an empty attributes are different. You can write a pattern that finds missing attribute values using the neg find construct (see later). This pattern is more complex, as it has three parameters and three constraints. The first two describe similar type constraints we have seen. The pattern also compares the values of variables host1 and host2 with each other using the != (not equal) operator (The == operator is also available). The well-formedness validation of the IP address strings requires specific validation blocks called check expressions where you can write a wide range of Xbase expressions, behaving similarly to Java and accessing Java classes from the classpath of the project. In this case, the well-formedness of the address values is represented with a regular expression evaluation. It is important to note that check expressions have to be side-effect free and can only be called on attribute variables. A pattern body might use variables other than the pattern parameters, such as the variable transition in this example. These variables are called local variables. It is important to note that if there are multiple transitions between two states, the match set will still include only a single pair of the states, because local variables are not included in the match tuples. If all edges are required, the corresponding transition variable should also be declared as a parameter. List bad host instances that fail either of the previous conditions. Disjunctions can be expressed by using the or keyword between pattern bodies. A model element tuple is included in the match set of a pattern, if at least one of the bodies have a match. Note that if multiple bodies would match the same tuple, the match set of the pattern will still only include the tuple once (set semantics). Patterns can be reused using find constraints meaning all conditions expressed by the called pattern must be matched from the source. This pattern also includes single-use (or don’t care) variables, starting with the character '_'. Such a declaration describes a variable where we are only interested in its existence but not its value. The negative pattern composition, expressed by the neg find keyword is used to define negative conditions. This works similar to the find constraints, with the notable exception that if there are any matches to the badHost with the selected parameters, the host pattern fails to match. Those actual parameters of the negative pattern call that are not used elsewhere in the calling body are universally quantified, meaning that the calling pattern only matches if variables of the calling pattern cannot be bound to matching elements. Patterns can be marked as private, making the pattern itself only visible inside the source file it is defined. The generated code for these patterns is reduced (e.g. does not include generated Match and Matcher classes for easier access). It is possible to calculate the matches of a pattern using the count find expressions. The value of such an expression is the number of matches found with the selected number of matches. The reachable states are calculated using the transitive closure of the previously introduced connectedTo pattern. VIATRA provides facilities to create validation rules based on the pattern language of the framework. These rules can be evaluated on various EMF instance models and upon violations of constraints, markers are automatically created in the Eclipse Problems View. key: The list of paremeters which determine which objects the constraint violation needs to be attached to. targetEditorId: An Eclipse editor ID where the validation framework should register itself to the context menu. Use ` * ` as a wildcard if the constraint should be used always when validation is started. To find a specific editor id, we can use the Plug-in Selection Spy tool with a Shift+Alt+F1 shortcut. For a few generic editors, such as the Sample Reflective Ecore Editor, the framework by default provides such a registration option, no manual registration is necessary. When adding such a constraint annotation to a graph pattern, the code generator initializes a validation project that includes and registers the rules derived from the patterns for the framework. 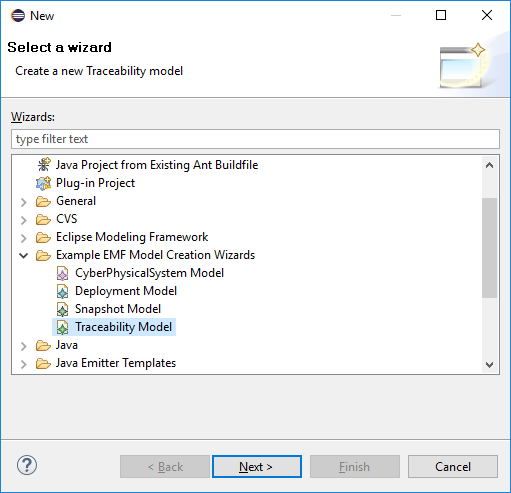 These rules can be tried out by opening a new, runtime Eclipse instance, opening an erroneous instance model in the model editor (the same one added to the targetEditorId parameter), and starting the validation from the popup menu items under VIATRA Validation. This section introduces a set of more complex queries, useful for both introducing the remaining language features such as aggregators while illustrating the way the query language allows breaking down more complex conditions. It is possible to find the Application Type that has the most instances defined in the model by combining a counting of the values of the related feature and a max function. The numberOfInstances helper pattern uses a count call of the ApplicationType.instances feature (note the omission of the find keyword there). This feature is available starting with VIATRA 2.0, and allows reducing the number of trivial helper patterns, like the pattern hostIpAddress introduced earlier in this tutorial. After the counts are available in the match set of a pattern, it is easy to calculate the maximum value using the max find construct. 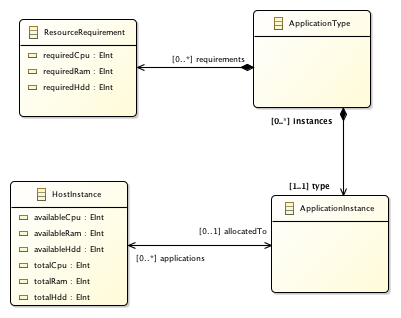 The CPS metamodel explicitly stores requirements of applications, and both free and total resource values in case of host instances. However, checking that application requirements and free and total values are consistent requires checking. In the following example we focus on the memory requirements, but similar queries can be provided for CPU or HDD requirements. The well-formedness constraint we are trying to enforce is as follows: FREE MEMORY + SUM(MEMORY OF DEPLOYED APPLICATIONS) = TOTAL MEMORY. The pattern requires two helper patterns: one of them (applicationTypeRequirementRAM) is responsible for collecting the RAM requirement for a selected Application Type, the other (totalMemoryRequirements) summarizes all memory requirements a selected application instance. Using these helper patterns, the invalidMemoryRequirement pattern executes two additional steps: (1) it summarizes the results of the pattern totalMemoryRequirements with regards to the application instances allocated to a host instance, and (2) checks whether the three requirements are consistent. A Host Instance is allocated to at most a single application, so it is not required to summarize the requirements of all applications here as done in the invalidMemoryRequirement pattern. However, adding this element to the query illustrates how to use sum correctly if multiple levels of summarization is necessary. VIATRA Query provides an API to execute queries on various models, including support for listening to match set changes. However, as the incremental evaluation relies on indexes, the API also covers lifecycle management for the runtime. The central element of the API is the Query Engine that is responsible for loading query specifications, setting up indexes and providing match results. This approach is supported by code generators that create a runtime representation for graph patterns and provide a type-safe API to access VIATRA code. To start working with the VIATRA Query API, we have to provide (1) a Scope representing the model and a (2) set of query specifications. The easiest way to initialize a scope, is to simply wrap an EMF ResourceSet inside a new EMFScope instace. For query specifications, the generated matcher classes can be used as an example, see as follows. In general, the generated code in a VIATRA Query project is based on a (1) query specification classes representing the original VQL specifications for the runtime API, sharing a qualified class name with the original pattern specification. Each query specification includes (2) a Match and Matcher nested subclass for each pattern definition (recommended for general usage). Finally, (3) a group class for each file that can be used to initialize all queries together, using the same Java classname as the original vql file. The default generated API structure was changed in VIATRA 2.0. Before VIATRA 2.0 query specifications, matches and matchers were generated into separate classes. The remainder of the tutorial relies on the new generation schema; using the old schema requires a few updates in the code, specifically for match and matcher class references are to be updated accordingly. 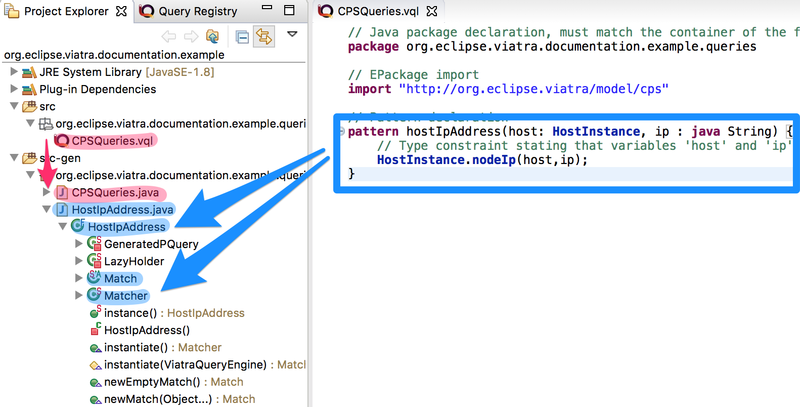 To illustrate the usage of the VIATRA Query API, we will create a headless Eclipse application, and execute it over one of the queries written in the previous part. Such an application is a Java class registered using the extension point org.eclipse.core.runtime.applications (requiring the org.eclipse.core.runtime bundle as a dependency). The IApplication interface requires two methods to be implemented, called start and stop. In our case, we will only use start (and returning 0 to mark successful execution), stop is unnecessary. 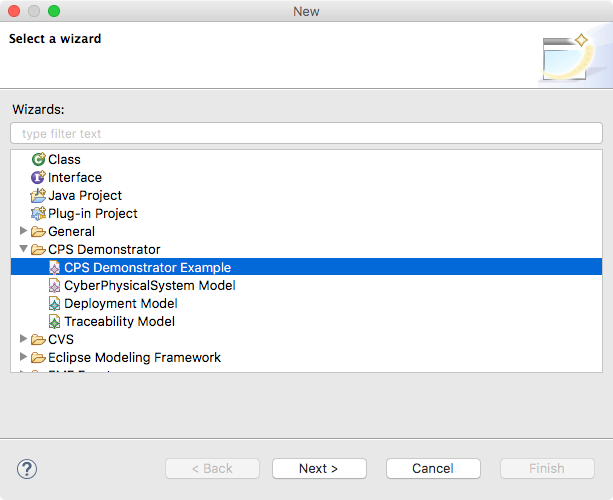 The created application can be started as an Eclipse application by specifically selecting the previously created extension. If we have a model scope, it can be used to initialize a managed query engine. The internal implementation of the ViatraQueryEngine.on method ensure that only a single query engine will be created for each scope, and the query engine will be disposed together with the backing model, making this the preferred implementation for common cases. Additionally, it is recommended to prepare the engine with all queries that will be used. 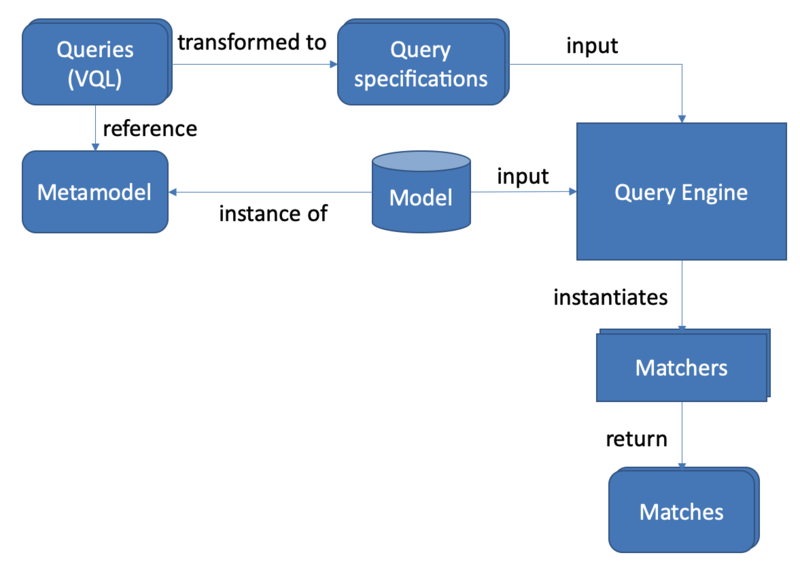 For this, the generated query groups (one per query file) include a prepare method that creates all indexes required for the pattern matchers, with only a single round of model traversal required. If multiple query groups are to be loaded, either create a generic pattern group that holds all the patterns, or create a coalesce traversal block where you can execute multiple prepare statements together using the engine.getBaseIndex().coalesceTraversals() method. It is safe to ask for the same matcher multiple times using the on method. Although the returned matcher instances may be different, but internally they reuse the same indexes. Given the matchers themselves are stateless, they are safe to use and forget, and at a later point ask for it again. It is also possible to use a more functional style processing of matches with a Consumer. Often it is beneficial to check for and process only a single match. For this reason it is possible to ask for a single match using the getOneArbitraryMatch method. In order to handle cases where the given matcher has no matches in the current model, this method returns with an Optional instance. The match returned by the getOneArbitraryMatch is neither random nor deterministic, but unspecified. Usually repeatedly calling it on the same model (without any model updates) returns the same match, but this is also not guaranteed. On the other hand, restarting the application on the same model usually changes the match returned. Before version 2.0, getOneArbitraryMatch returned null if no matches are available. Do not forget to handle this case if necessary. The generated matchers also include a few methods to access values of the parameters. For example, in case of the hostIpAddress pattern there is a getAllValuesOfip method that returns all values the parameter ip finds. If there are multiple hosts that have the same IP address, the getAllValuesOfip() call will return each IP address only once. This is consistent with all other APIs that always return sets. If duplicates are required, you have to process all matches manually. All matcher functionality supports filtering the matches with constants. By setting some filter parameters with a non-null value we state that we are interested in only matches where the selected parameters equal to the given value. Regardless of input values receiving null values, the getAllmatches (and similar operations) will never return matches with null values. If no matches fulfill all the set parameters, the returned set will be empty. If a filter condition has to be reused, it is possible to create mutable matches where the filtered values are set accordingly. This approach is also useful to use named setters (e.g. if multiple String parameters are to be set) or one does not want to write null literals. Finally, if we are only interested in whether there exist any match fulfilling the query, or we want to know how many matches there are, the matcher has methods that calculate these. Both of these methods can be combined with filter matches. If asking for the has/count calls is immediately followed by the processing of the said matches, it is usually better to call getAllMatches or getOneArbitraryMatch directly, and calculate the count/existence using them. There are cases where the standard engine lifecycle is inappropriate, e.g. the models will not be unloaded but we want to spare memory by freeing up indexes. Furthermore, there are some functionality, like hint handling or match update listener support that was not added the the base implementation to keep its API clean. Do not forget to dispose unmanaged engine manually using the AdvancedQueryEngine.dispose() method. If you want to use managed query engines but use the advanced features, you might use the AdvancedQueryEngine.from(engine) call; however, do NOT dispose such engines. One feature of the advanced query engine is to allow listening to changes, e.g. registering a match update listener for a pattern matcher. Such a listener is triggered when the match set for a pattern matcher changes, together with the direction of the changes. By registering the match update listener with a true value for the fireNow parameter, we ensure that all existing matches are sent to the listener. If we only want to consider future updates, set that parameter to false. When looking at the output, the setNodeIp call will result in two changes: the first one represents the removal of the old match (host - old IP pair), while the second one represents an addition of a new one (host - new IP pair). In general, a model update can often often result in multiple match changes (even on a single pattern). Be very careful when using match update listeners, as sometimes they are called while the model indexes are in an inconsistent state. For this reason, do not update the underlying model and do not execute further model queries. If such cases are required, delay the execution for a later phase. Better still, you can rely on the transformation API of VIATRA that ensure that rules are only executed when the indexes are in a consistent state. The advanced query engine also allows to initialize patterns with non-default settings called hints. The most important feature of these hints allow setting the pattern matcher backend, and other backend-specific settings could be changed. In addition to Rete-based incremental query evaluation VIATRA also includes a local search-based approach. By default, Rete is used, but by adding the org.eclipse.viatra.query.runtime.localsearch bundle as a dependency of the project, it is possible to generate local-search specific evaluation hints using the LocalSearchHints class. Similar, Rete-specific hints are available in the ReteHintOptions class. The backend-specific hints are beyond the scope of this tutorial, for more details see the corresponding VIATRA documentation or Javadoc. As you can see, after the initialization the local search based backend can be queried with the same backend as the Rete-based one, however, it calculates the results when queried instead of relying on previously cached results. This means, usually it is cheaper (in memory and prepare time) to initialize a local search based matcher, but gathering the results is more expensive. As the name suggests, hints might be ignored by the query engine, e.g. if an incorrect configuration was set, or the engine knows of a functionally equivalent way that has a better performance. For details about the hints, consult the LocalSearchHints and ReteHintOptions classes. Recursive queries are not supported. Trying to initialize a query with recursion results in a runtime error. The algorithm cannot provide change notifications, so registering a MatchUpdateListener over local search-based queries is prohibited. The local search backend of VIATRA is almost functionally compatible with the Rete-based backend, but has very different performance characterics. If performance is critical, make sure to understand both algorithms to choose the appropriate one for the problem at hand. For model transformation development a Java API is available, allowing seamless integration of the transformations into any Java applications. However, to enhance readability, we recommend using a higher-level JVM language, as it allows defining the transformation as an internal DSL of this host language. In this tutorial we rely on the Xtend language to host the VIATRA transformation DSL, and we rely on its extension method and type inference support to reduce unnecessary elements. However, other JVM-based languages can also be used with similar efficiency (for an example in Kotlin see https://gist.github.com/doczir/bfe95c470599c5b8e60b400b80f92ea2). This exercise helps the audience to create a simple batch transformation using the VIATRA Transformation API. The transformation will transform the hosts and applications in a CPS model to a deployment model. The exercise also covers registering a menu command which initializes the transformation. 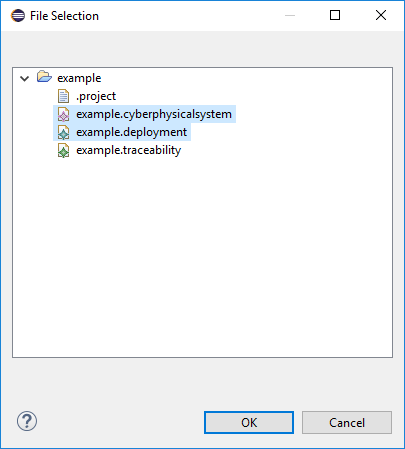 In the created file we have to register a few extension methods, more specifically for our used queries (CpsXformM2m, the same name the VQL file uses) and the EMF EPackages we want to refer (here the deployment and traceability packages). A few additional extension methods are already registered, e.g. transformation rule builder and model manipulation API. The IModelManipulations implementation is used to make model access replaceable, this way the same transformation may be used for cases where the resource set is transactional. The initialization of this is generated automatically into the createTransformation method. A VIATRA query is used as precondition to the rule, which means the rule will be activated each time the given pattern when changes allowing to update the output accordingly. This exercise heps the audience to create a simple event-driven transformation using the VIATRA Transformation API. The transformation will create (and then incrementally update while active) a deployment model based on a CPS model. The exercise also covers registering a menu command which initializes the transformation. Given the batch and event-driven transformations are really similar, this section focuses mainly on the differences; if required, consult the batch transformation tutorial. Specific patterns have to be defined for event-driven rules; note that there are small differences to the batch definitions, e.g. there is an additional pattern called allocatedDeploymentApplication. A VIATRA query pattern is used as precondition to the rule, which means the rule will be activated each time the given pattern changes allowing to update the output accordingly. The lifecycle defines the state machine used to determine the possible states on which transition actions can defined. val depApp = engine.cps2depTrace.getOneArbitraryMatch(cps2dep, null, appInstance, null). For cases when it is possible to have more than one rules activated (e.g. a new HostInstance is added to the model with already set allocated applications) a conflict resolver is used to provide a fixed ordering of rules to be executed. 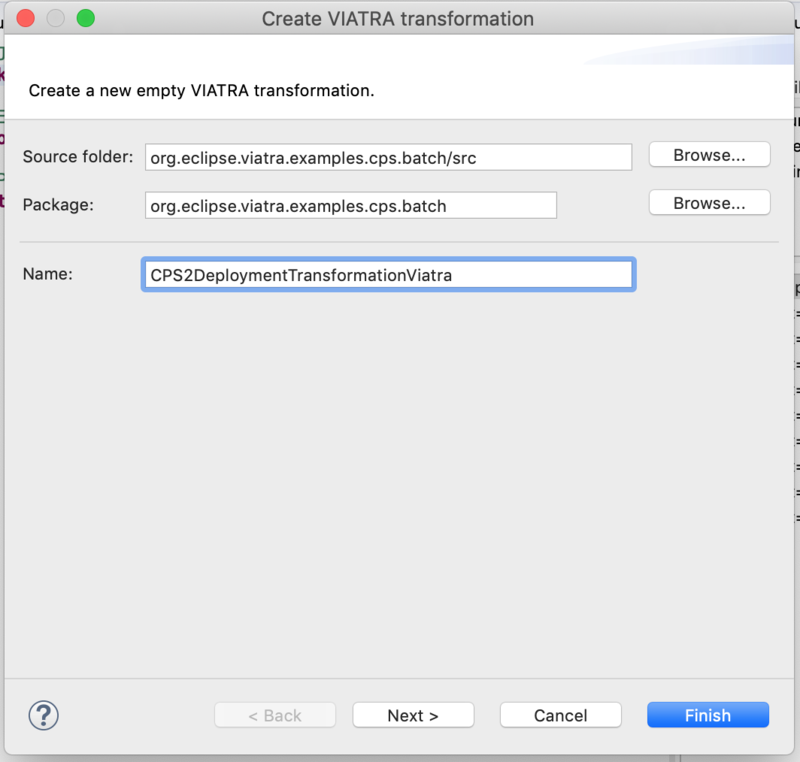 Root element shall be "CPS To Deployment"
Display the state of remote VIATRA transformations. 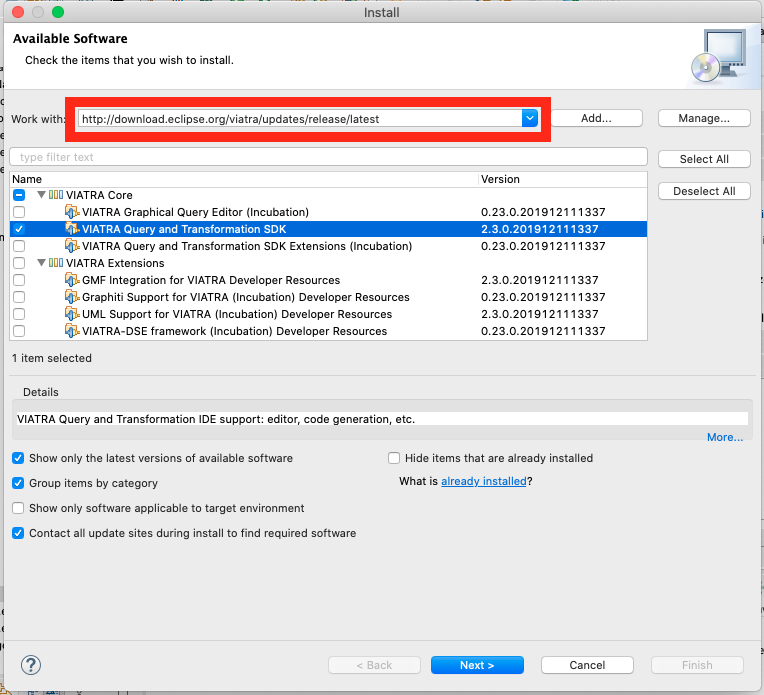 Allow the user to control the execution of VIATRA transformations, via standard debugger commands ("Step over", "Continue") or by selecting the next activation to be executed. 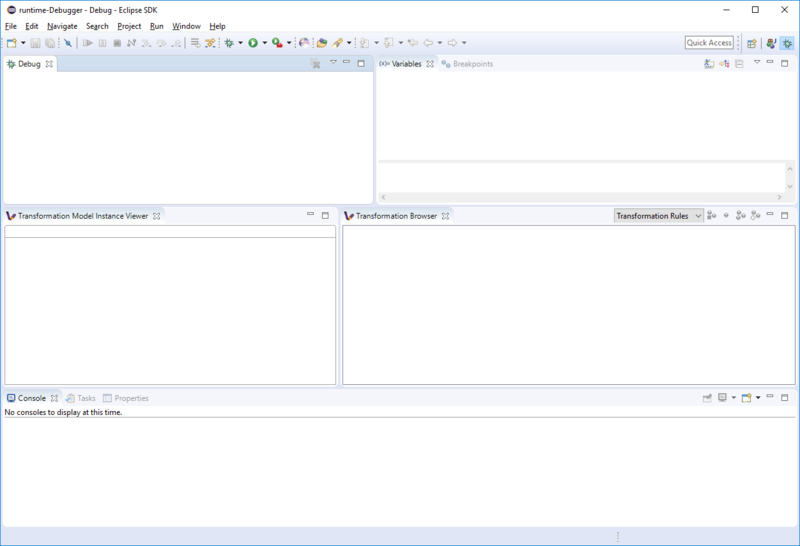 Display the model instances associated with the transformation under debugging. Allow the user to define various transformation breakpoints. If the transformation is being newly developed, it is highly advised to use the VIATRA model transformation creation wizard. As shown on the figure below, the user can select the "VIATRA debugger support" checkbox, this way the generated code will incorporate the appropriate setup. Use the VIATRA Debugger Session Name optional parameter to define a textual identifier for the transformation. Usage of this identifier helps the transformation developer to differentiate between different model transformation sessions, while using the transformation debugger. In case of an already-existing transformation, the model transformation definition needs to be modified manually. 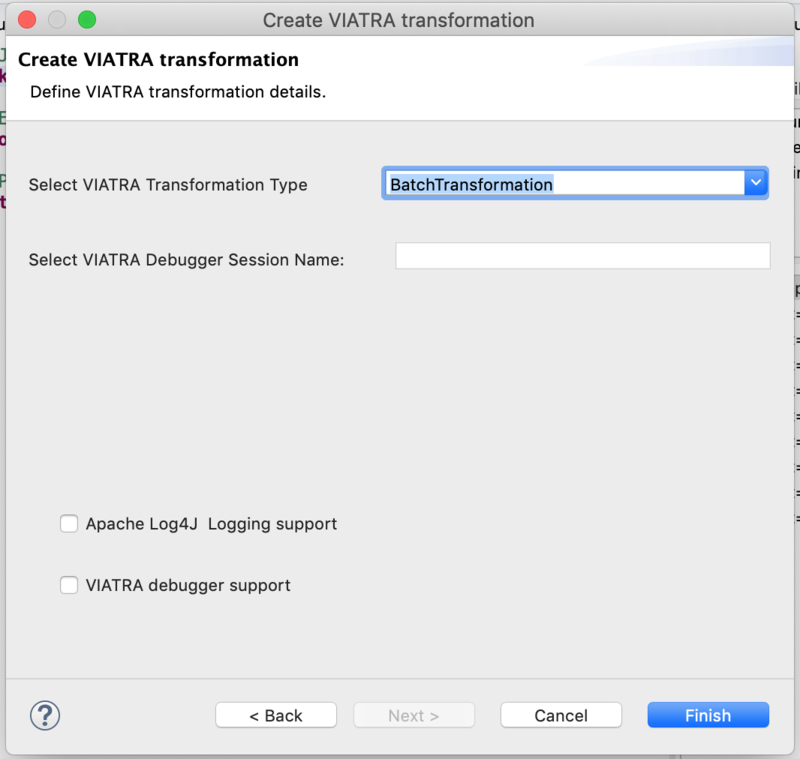 This involves adding the VIATRA debug configuration to the VIATRA transformation builder. The following example snippet shows how this is achieved in the example. As the VIATRA transformation debugger is a Remote Debugging-style debugger, the example transformation needs to be started manually. This is especially true in case of batch transformations, since event-driven transformations typically run continuously. The example uses a simple command and handler to run the model transformation on a predefined test model. -Dcom.sun.management.jmxremote.port="port to be used, typically 1099"
The following section describes how to use the VIATRA transformation debugger UI elements once the debugging infrastructure is set up. This section of the guide assumes that a target Eclipse instance is running. 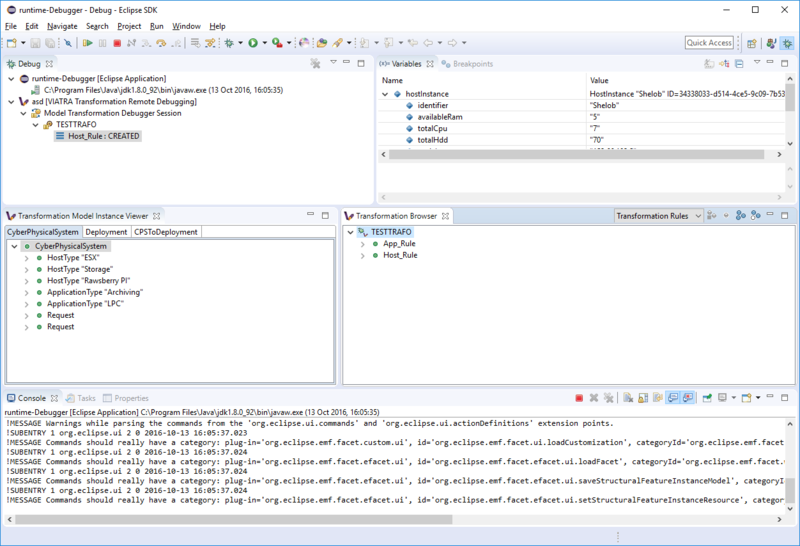 If the VIATRA debugger feature is installed, the Debugger UI Elements are contained by the Eclipse Debug perspective, once this perspective is selected, the related VIATRA debug views are displayed. The debugger can be initialized via launching a VIATRA Transformation Remote Debugging debug configuration. 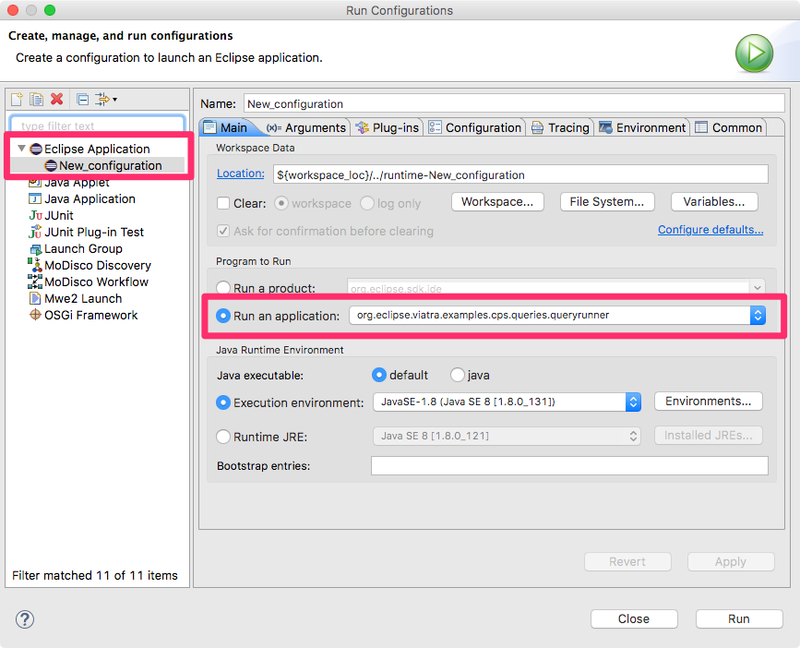 The debug configuration can be specified similarly to any other Eclipse launch configuration. As the figure below shows, firstly, the target port needs to be specified. This value needs to be equal to the port value specified in the target Eclipse launch configuration (typically its 1099). Next the port needs to be queried, via using the button located next to the port text field. After the querying is completed, the user can select from a set of transformation instances that are present on that port. 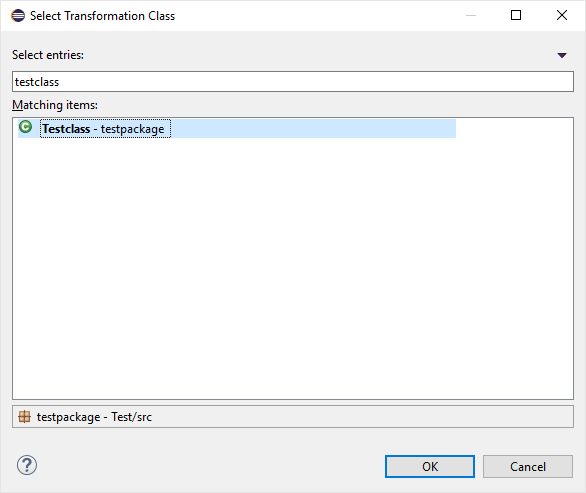 Finally, a class file present in the workspace needs to be selected, as the breakpoints associated with the transformation will be bound to the resource of this file. 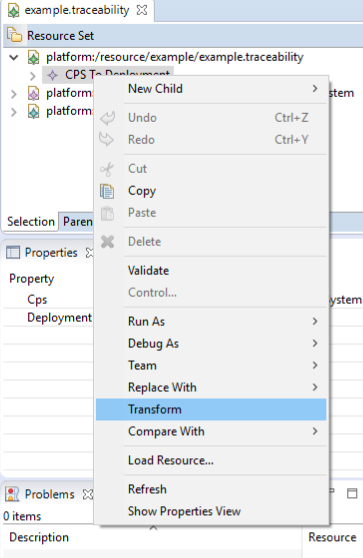 These launch configurations are saved, once the user defines a configuration for a target transformation, it can be reused without any required modifications (Assuming that the user did not modify the ID of the transformation session). After launching the debug configuration, the debug session is initialized allowing the user to observe and control the execution of the selected transformation. 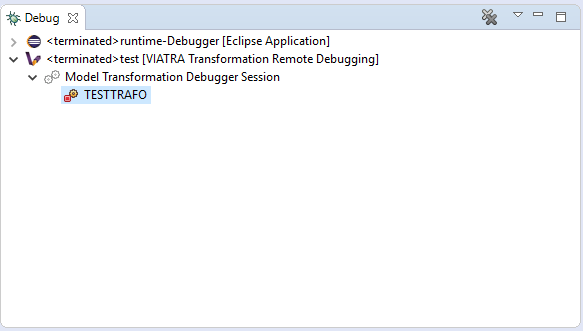 Here the transformation debugging session is displayed in the Eclipse debug view. There are however additional contemporary views that display the details of the selected debug session. The Transformation Browser view is responsible for observing the internal state of the transformation. It allows the user to observe the current transformation rule activations, and it supports the definition of various transformation breakpoints. 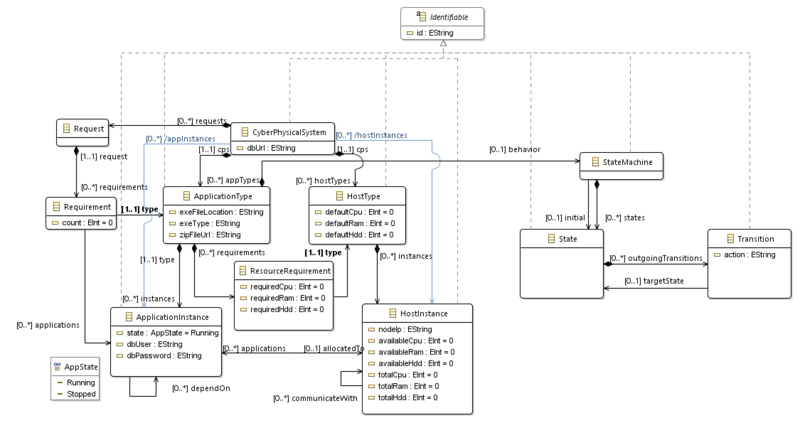 The Transformation Model Instance Viewer enables the transformation developer to observe the state of the source and target model instances related to the model transformation selected in the Adaptable Transformation Browser view. This view displays the model instances in a multi-tabbed tree view with properties view support. 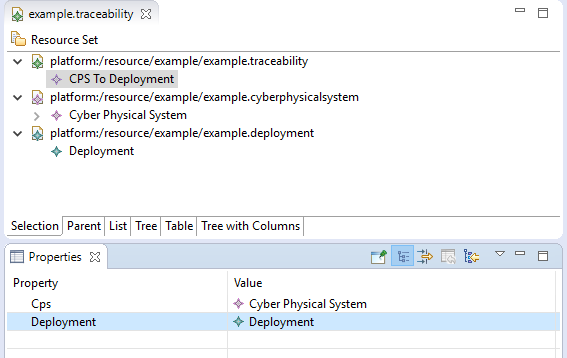 The parameters of the next activation to be executed can be observed via the Variables Eclipse Debug View. After selecting the given debug stack frame (representing a transformation rule activation), the parameters of the transformation rule precondition are displayed as variables. 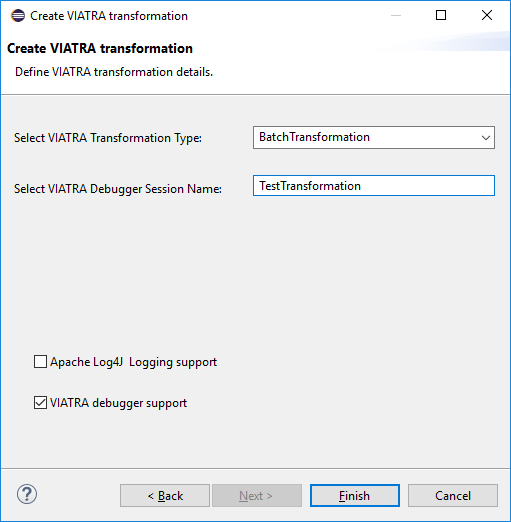 The VIATRA transformation debugger enables the transformation developer to control the execution sequence of the transformation under debugging. This can be done in the following ways. 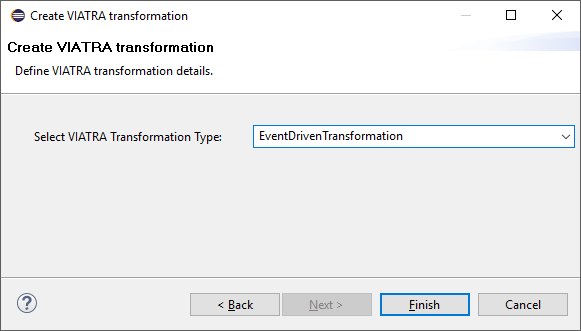 Activation breakpoint: Activation breakpoints can be toggled via selecting a rule activation and using the appropriate command on the Transformation Browser view. 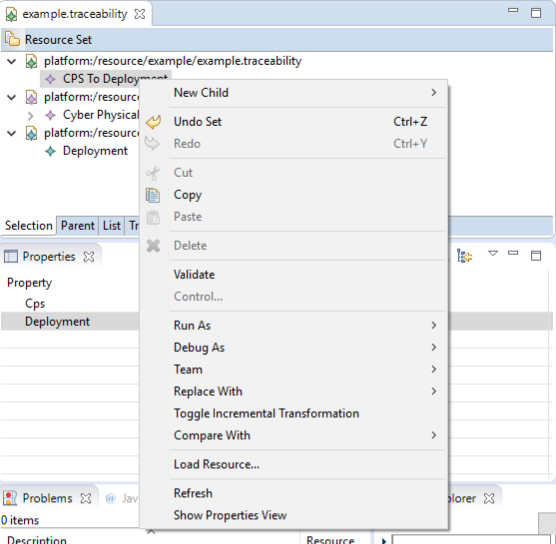 Rule Breakpoint: Rule breakpoints can be created via selecting a model transformation instance and using the appropriate UI element. 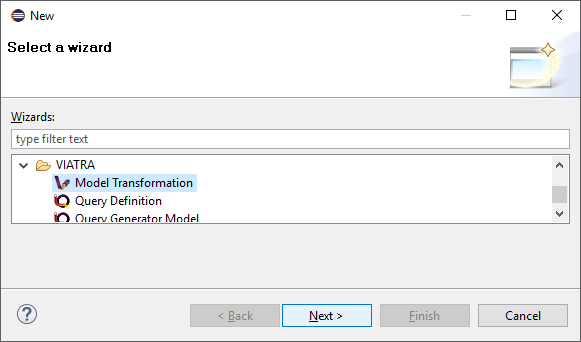 Once this is done, the following dialog opens, on which the transformation developer can specify the name of the transformation rule. Once an activation is about to be executed, the debugger checks if the activation derives from the rule associated with the specified name. If this condition is true, the execution is halted. 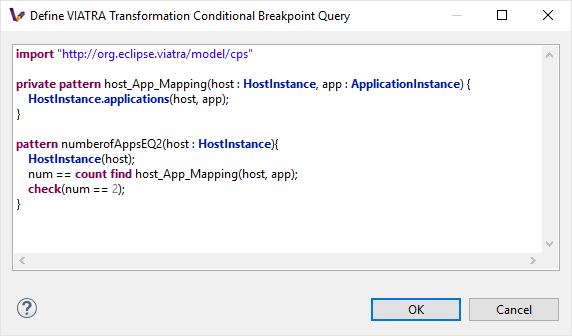 Conditional breakpoint: These breakpoints allow the user to define VIATRA Query based conditions to halt the execution of the transformation. In order to create a conditional breakpoint, select a model transformation instance in the Transformation Browser view, and use the appropriate command on the view’s command bar. Afterwards, a dialog window opens which allows the user to define VIATRA query patterns. The execution of the transformation is halted once the match set of the pattern changes. This editor reuses the standard Xtext based VIATRA query editor, however in this case, package definitions should be omitted (as there is no enclosed Eclipse resource to the file). Furthermore, the definition can contain only one public pattern at this point, this restriction, however, does not apply to private patterns. The rule and conditional breakpoints are persisted between individual transformation debugging sessions. The breakpoints are contained in a common breakpoint pool managed by the Eclipse Breakpoint Manager. The breakpoints added are displayed in the Breakpoints Eclipse Debug view. Which can be used to disable and remove these breakpoints. If the transformation execution is halted, use this command the execute the next activation, and stop the execution again. If the transformation execution is halted, use this command to continue the execution of the transformation until a breakpoint is hit. The transformation is resumed and the debugger agent is disconnected from the target transformation. The transformation debugging session is terminated. A few debug commands are not supported for now, including Step Return, Step Into, Suspend and Disconnect. The transformation debugger allows the user to define which activation should be executed next. In order to do this, select an activation and use the appropriate command to set it as the next activation to be executed. The changes made this ways could produce unpredictable behavior in the model transformation (Overriding the defined priority could result in inconsistent model states). Use this feature cautiously. Once the next activation is selected, notice that the red rectangle representing, the next activation to be fired, is moved to the desired activation. At this point, if the transformation is resumed, it will continue its execution from the selected activation. 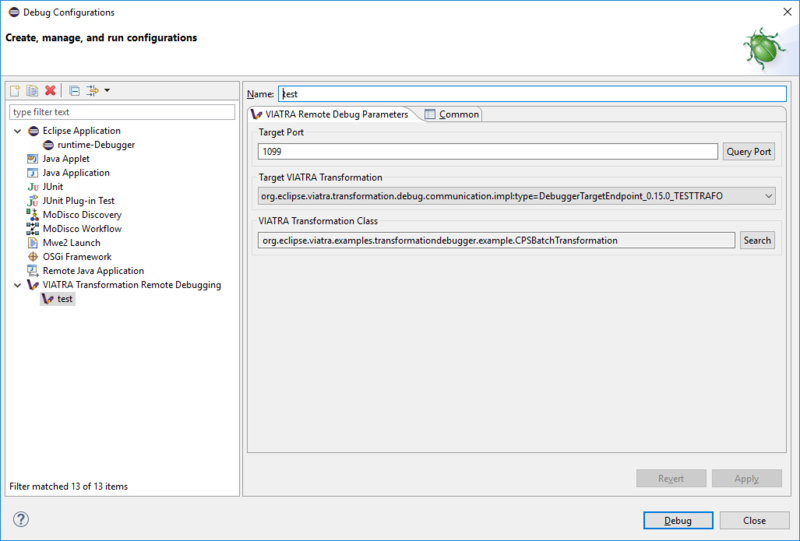 If the VIATRA transformation instance specified in the debugger launch configuration does not exist, the debugger tooling will inform the user, that the debugging session could not be initialized and terminate the newly created session as well. 4.3.3.2. Transformation under debugging terminated abruptly. 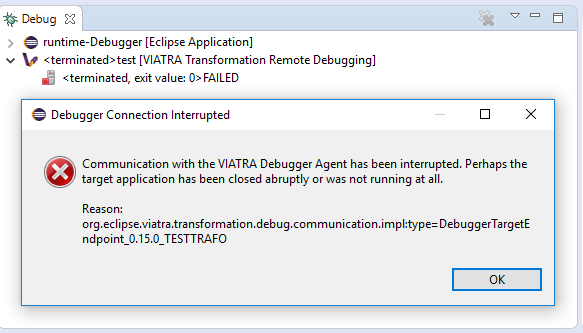 If the eclipse instance in which the target transformation is running is terminated, or the connection is severed between the host and target components, the debugger tooling will terminate the respective VIATRA debugger launch automatically. 4.3.3.3. Trying to add a conditional breakpoint, but the Xtext parser infrastructure is not initialized. In order to ensure that the conditional breakpoint patterns are parsed properly in the runtime Eclipse instance, the Xtext parser infrastructure needs to be initialized. If the debugger tooling produces the following exception, open a VIATRA query view (e.g. : VIATRA Query Explorer) to manually initialize the parser tooling. These manual steps are needed, as Xtext-based parser tooling components are loaded lazily.